For the album by Sandy Bull, see E Pluribus Unum (album). For the public artwork proposed by Fred Wilson, see E Pluribus Unum (Wilson). "Out of Many, One" redirects here. For the Tami Chynn album, see Out of Many...One. E pluribus unum (/ˈiː ˈplɜːrɪbəs ˈuːnəm/; Latin: [ˈeː ˈpluːrɪbʊs ˈuːnũː])—Latin for "Out of many, one" (translated as "One out of many" or "One from many")—is a 13-letter traditional motto of the United States, appearing on the Great Seal along with Annuit cœptis (Latin for "he approves the undertaking [lit. 'things undertaken']") and Novus ordo seclorum (Latin for "New order of the ages"), and adopted by an Act of Congress in 1782. 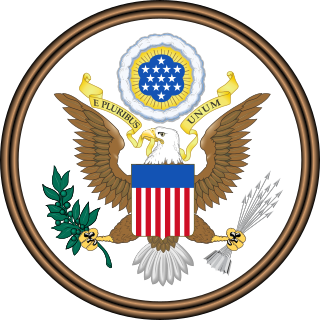 Never codified by law, E pluribus unum was considered a de facto motto of the United States until 1956 when the United States Congress passed an act (H. J. Resolution 396), adopting "In God We Trust" as the official motto. Original 1776 design for the Great Seal by Simitiere. The shields with 13 initials of the colonies linked together with motto. The meaning of the phrase originates from the concept that out of the union of the original Thirteen Colonies emerged a new single nation. It is emblazoned across the scroll and clenched in the eagle’s beak on the Great Seal of the United States. The thirteen-letter motto was suggested in 1776 by Pierre Eugene du Simitiere to the committee responsible for developing the seal. At the time of the American Revolution, the exact phrase appeared prominently on the title page of every issue of a popular periodical, The Gentleman's Magazine, which collected articles from many sources into one magazine. This in turn can be traced back to the London-based Huguenot Peter Anthony Motteux, who used the adage for his The Gentleman's Journal, or the Monthly Miscellany (1692-1694). The phrase is similar to a Latin translation of a variation of Heraclitus's tenth fragment, "The one is made up of all things, and all things issue from the one" (ἐκ πάντων ἓν καὶ ἐξ ἑνὸς πάντα). A variant of the phrase was used in "Moretum", a poem belonging to the Appendix Virgiliana, describing (on the surface at least) the making of moretum, a kind of herb and cheese spread related to modern pesto. In the poem text, color est e pluribus unus describes the blending of colors into one. St Augustine used a variant of the phrase, ex pluribus unum, in his Confessions. But it seems more likely that the phrase refers to Cicero's paraphrase of Pythagoras in his De Officiis, as part of his discussion of basic family and social bonds as the origin of societies and states: "When each person loves the other as much as himself, it makes one out of many (unus fiat ex pluribus), as Pythagoras wishes things to be in friendship." While Annuit cœptis ("He favors our undertakings") and Novus ordo seclorum ("New order of the ages") appear on the reverse side of the great seal, E pluribus unum appears on the obverse side of the seal (Designed by Charles Thomson), the image of which is used as the national emblem of the United States, and appears on official documents such as passports. It also appears on the seal of the President and in the seals of the Vice President of the United States, of the United States Congress, of the United States House of Representatives, of the United States Senate and on the seal of the United States Supreme Court. Dime E pluribus unum engraving. Obverse: Portrait of Franklin D. Roosevelt, year and US national motto (In God We Trust) Reverse: E pluribus unum, olive branch, torch and oak branch, face-value and country. Total 86,408,282,060 coins minted from 1965 to 2015. 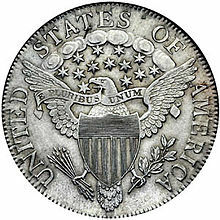 The first coins with E pluribus unum were dated 1786 and struck under the authorization of the State of New Jersey by Thomas Goadsby and Albion Cox in Rahway, New Jersey. The motto had no New Jersey linkage but was likely an available die that had been created by Walter Mould the previous year for a failed federal coinage proposal. 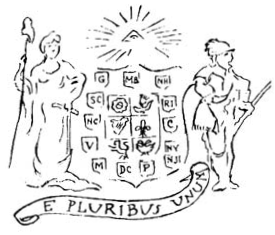 Walter Mould was also authorized by New Jersey to strike state coppers with this motto and did so beginning in early 1787 in Morristown, New Jersey. Lt. Col. Seth Read of Uxbridge, Massachusetts was said to have been instrumental in having E pluribus unum placed on U.S. coins. Seth Read and his brother Joseph Read had been authorized by the Massachusetts General Court to mint coppers in 1786. In March 1786, Seth Read petitioned the Massachusetts General Court, both the House and the Senate, for a franchise to mint coins, both copper and silver, and "it was concurred". E pluribus unum, written in capital letters, is included on most U.S. currency, with some exceptions to the letter spacing (such as the reverse of the dime). It is also embossed on the edge of the dollar coin. (See United States coinage and paper bills in circulation). 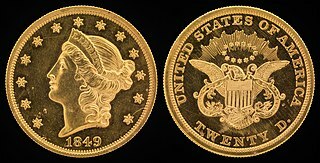 According to the U.S. Treasury, the motto E pluribus unum was first used on U.S. coinage in 1795, when the reverse of the half-eagle ($5 gold) coin presented the main features of the Great Seal of the United States. E pluribus unum is inscribed on the Great Seal's scroll. The motto was added to certain silver coins in 1798, and soon appeared on all of the coins made out of precious metals (gold and silver). In 1834, it was dropped from most of the gold coins to mark the change in the standard fineness of the coins. In 1837, it was dropped from the silver coins, marking the era of the Revised Mint Code. An Act of February 12, 1873 made the inscription a requirement of law upon the coins of the United States. E pluribus unum appears on all coins currently being manufactured, including the Presidential dollars that started being produced in 2007, where it is inscribed on the edge along with "In God We Trust" and the year and mint mark. After the revolution, Rahway, New Jersey became the home of the first national mint to create a coin bearing the inscription E pluribus unum. In a quality control error in early 2007 the Philadelphia Mint issued some one-dollar coins without E pluribus unum on the rim; these coins have since become collectibles. The 2009 and new 2010 penny features a new design on the back, which displays the phrase E pluribus unum in larger letters than in previous years. The motto appears on the logo of the Shire of Boulia, Queensland, Australia. The motto E pluribus unum is used by Portuguese multi-sport club S.L. Benfica. This motto has also been used in the Eden novel of Stanislaw Lem (cited by Doctor). This motto has also been used by the Scoutspataljon, a professional infantry battalion of the Estonian Defence Forces, since 1918. The motto appears on the coat of arms of the city of Mongaguá in Brazil. A variant of the motto, unum e pluribus is used by the Borough of Wokingham in Berkshire, England. E Pluribus Unum is a march by the composer Fred Jewell, written in 1917 during World War I. "E unibus pluram" is the title of a 1996 essay by David Foster Wallace which appears in the collection A Supposedly Fun Thing I'll Never Do Again. In 2001, following the September 11 attacks, the Ad Council and Texas ad agency GSD&M launched a famous public service announcement in which ethnically diverse people say "I am an American"; near the end of the PSA, a black screen shows and the phrase "E pluribus unum" is seen with the English translation underneath. "One Out of Many", a story about an Indian servant who travels to Washington with his employer, is included in V. S. Naipaul's novel In a Free State. ^ a b "e pluribus unum". treasury.gov. Retrieved March 29, 2012. ^ a b "E Pluribus Unum - Origin and Meaning of the Motto Carried by the American Eagle". Greatseal.com. November 28, 2011. Retrieved April 28, 2012. ^ "E Pluribus Unum". Collins English Dictionary - Complete & Unabridged 10th Edition. HarperCollins. Retrieved December 23, 2012. ^ "E Pluribus Unum". Retrieved March 29, 2012. ^ H. John Lyke (September 6, 2012). What Would Our Founding Fathers Say? : How Today's Leaders Have Lost Their Way. iUniverse. p. 34. ^ "Text of H.J.Res. 396 (84th): Joint resolution to establish a national motto of the United States (Passed Congress version) - GovTrack.us". GovTrack.us. ^ "The Gentleman's Magazine". Encyclopædia Britannica. ^ "The Gentleman's Magazine, and Historical Chronicle". 1747. ^ Cicero, Marcus Tullius. De Officiis. Book 1, Section 56. ^ "Resource center faqs/coins accessed 2011-06-27". Treasury.gov. Retrieved March 3, 2012. ^ "Massachusetts Coppers 1787-1788: Introduction". University of Notre Dame. Retrieved October 9, 2007. ^ March, 1786 Petition to mint Massachusetts Coppers, source Google books. Books.google.com. Retrieved March 3, 2012. ^ "The Wokingham Borough Coat of Arms". Wokingham Borough. Retrieved June 13, 2014. ^ "I am an American". Ad Council/GSD&M. Retrieved January 3, 2013. 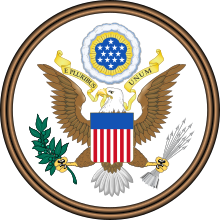 Wikimedia Commons has media related to E pluribus unum. 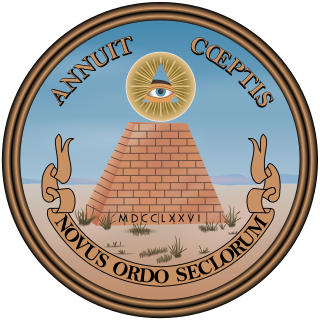 The phrase Novus ordo seclorum is the second of two mottos that appear on the reverse of the Great Seal of the United States. The Great Seal was first designed in 1782, and has been printed on the back of the United States one-dollar bill since 1935. The phrase Novus ordo seclorum is sometimes mistranslated as "New World Order" by people who believe in a conspiracy behind the design. Pierre Eugene du Simitiere was a Swiss American member of the American Philosophical Society, naturalist, American patriot, and portrait painter. 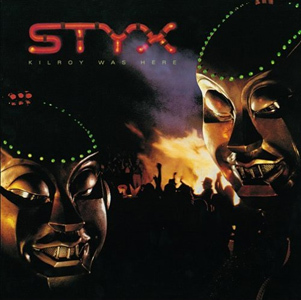 Kilroy Was Here is the eleventh studio album by the rock band Styx, released on February 22, 1983. The album is named after a famous World War II graffito, 'Kilroy was here'. It was the final album of original material to be released by the "classic" lineup of Dennis DeYoung, Tommy Shaw, James "J.Y." Young, John Panozzo, and Chuck Panozzo. 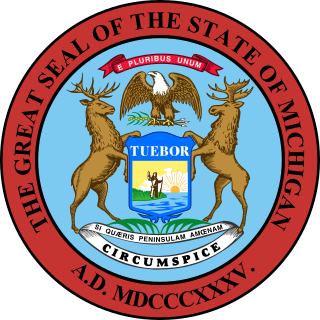 The Great Seal of the State of Michigan depicts the coat of arms of the U.S. state of Michigan on a light blue field. On the dark blue shield the sun rises over a lake and peninsula, a man holding a long gun with a raised hand represents peace and the ability to defend his rights. The elk and moose are symbols of Michigan, while the bald eagle represents the United States. The United States four dollar coin, also officially called a Stella, is a unit of currency equivalent to four United States dollars. The half eagle is a United States coin that was produced for circulation from 1795 to 1929 and in commemorative and bullion coins since the 1980s. Composed almost entirely of gold, it has a face value of five dollars. Its production was authorized by The Act of April 2, 1792, and it was the first gold coin minted by the United States. Seth Read was born in Uxbridge, Worcester County, Massachusetts, and died at Erie, Erie County, Pennsylvania, as "Seth Reed", at age 51. The Classic Head was a design issued by the mint in the early 19th century. It was introduced for copper coinage in 1808 by engraver John Reich and later redesigned and improved by Chief Engraver William Kneass.